Your WordPress theme is one of the main core components that defines the look and feel of your website. While WordPress theme development has become a popular and profitable business for some developers and designers, all developers working with WordPress should know how to customize – if not construct – a quality theme. Professional premium themes in popular marketplaces contain dozens of in-built features and components to define the presentation and functionality of WordPress websites. Nevertheless, we need to be able to make the themes extendable and customizable, allowing their users to stand out from the rest and to meet specific needs. WordPress action hooks provide an excellent way to extend WordPress themes. In this tutorial, we’re going to look at how we can effectively use these action hooks. Here I am assuming that you have some basic knowledge of using WordPress action hooks. Themes are built by designers of developers based on their imagination. You may think you have the capabilities to design the “perfect theme” with all the necessary features. But still there will be people who want your theme to have certain modifications to the design, before being willing to use it on their own websites. Here is a screenshot of my favorite WordPress theme called Avada. I like most things in the features and design, but I don’t like the social menu (highlighted). I’d prefer to use my own design for this section. Similarly, each user may have their own requirements. No WordPress developer can satisfy everyone with any one theme design. But we can extend and adapt themes, so that anyone can have a unique design built with components on top of the basic design and features. WordPress action hooks simplify this process. With action hooks, we can remove existing components or add new components as necessary. Anyone who is experienced in WordPress development can then easily customize the existing features by modifying the theme code or adding custom codes through plugins. Included in the head section of the theme for plugin developers to add their own scripts, styles and necessary information. Calling the wp_head function in your theme header, will call the do_action function inside the core code. Included just before the closing body tag of the HTML document, for plugin developers to add scripts, styles and necessary display information. wp_footer works in a similar way to the wp_head function and calls the do_action function inside the core files. Used to modify the design and fields of existing comment form for posts and pages. Now it’s time to develop our own custom hooks specific to themes. The real power of hooks comes with this method as we can define any number of custom hooks anywhere in the theme. First let’s consider the following code which creates a custom action hook for our themes. These days, many websites offering a product or services have a blog or articles section to attract readers and market their products. So they produce articles about information related to the product. The goal is to market the products through the blog. Often, we see advertisements or promotion placed just after the post title. In such scenarios we can use the preceding code to implement the feature. add_action function takes a custom action name and function name unique to the application. Then we can add the do_action in the theme after the title of the post to display the promotion banner as shown in the following code. Having action hooks in important positions like this allows plugin developers to quickly add custom features without digging into the core theme code. Once you define custom action hooks and make it public, any developer can implement them using various plugins. In situations where two or more developers implement the same hook in their plugins, precedence of the actions becomes a concern. Consider the following code where two plugins implement the same action. In this scenario, which action executes first depends on the plugin name and how the plugin is positioned in the active_plugins field in wp_options table. Let’s say we want to display the output of Plugin 2 before the output of Plugin 1. We won’t be able to get it work with the above technique since Plugin 1 is located first in the active_plugins field. The priority parameter of action hooks becomes useful at this point. We can pass a numeric value as a third parameter to define the execution priority of the action hooks. Let’s consider the preceding example with priority values. Now you will be able to see the execution of Plugin 2 function before the Plugin 1 function based on the priority level given. As value gets higher, priority will get lower and hence will execute further down the page. So it’s better to define your action hooks with priority values so that precedence of other actions can be adjusted according to the required positioning. How to Add Pluggable Action Hooks to Themes? WordPress action hooks implementation consists of two parts. First we define an action hook using add_action function. Then we execute the action hook using do_action. As theme developers, your responsibility is to execute action hook when necessary. Defining and implementing the action needs to be done by plugin developers. So whenever you want to use an action hook, just place the following code in necessary locations. Proving action hooks makes it easy for plugin developers to add new sections and content for the theme layout. But what if someone wants to change existing section? 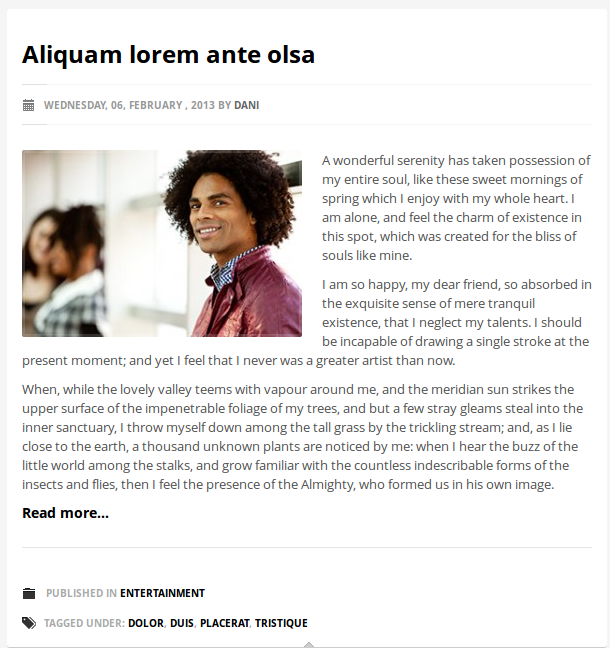 This screen shows the blog post design of a WordPress theme. You can see the post date and author under the title. Also the category and tags are placed at the end. Let’s say you don’t like the design of these components and want to design your own. If those sections are directly inserted into the theme, it’s difficult for plugin developers to change the design without modifying the core theme code. Let’s see how we can provide a solution with action hooks. All the sections are defined as action hooks instead of directly embedding into HTML document. The following code implements the post_date_and_author action inside the theme functions file. 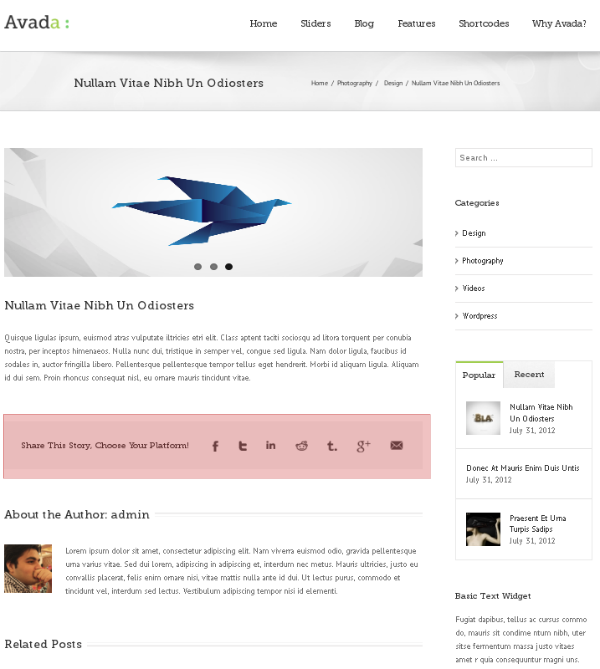 Now you have can replace existing design components as well as add new components to the theme. Following is the implementation for the preceding scenario inside a custom plugin. Here, the developer has provided their own design for the date and author section. The original post_date_and_author hook defined by the theme will be removed on init action. Then we add the same action with plugin specific functions to modify the date section design. The following screen previews how the previous layout can be changed to provide a different design. You can add any number of action hooks add features to make your theme highly customizable. Plugin developers are not aware of the available theme hooks, unless they explore the source codes to find them. Therefore it’s ideal to document the available action hooks of your theme. One way of using action hooks is to add scripts, styles and similar contents which work internally without displaying anything on the browser. Another way is to directly modify the page layout to add design components or remove existing components. If you do go with action hooks, your documentation needs to include the details such as the positioning of the action hook in the template, preferred parameters, dimensions of the content and types of design components preferred in the given locations. Now it’s time to help each other by sharing our experiences. Feel free to add your suggestions on action hooks and how you use them effectively in your WordPress themes.